Season one of The Flash has gone by in a flash (sorry), and we're now heading for the season finale. As usual, I am here to give you a mega, meta-recap post of the last few episodes to lead up to the conclusion of season one. My recaps for each episode will be as quick as lightning (sorry), only touching briefly on the most important events that have transpired to lead Barry Allen to this point in his life. Are you ready to take on the Reverse Flash? You will be after this (I hope). The Weather Wizard (as Cisco dubs him) arrives to avenge his brother's death (see episode one) by targeting Detective Joe West. Meanwhile, Barry and Linda have an awkward double-date with Iris and Eddie, which makes everybody agitated. Weather Wizard kidnaps Joe (surprise, surprise), and threatens Central City with a tsunami. In order to save Joe and the city, Barry reveals himself to Iris as the Flash (who declares her romantic feelings for him) and runs back and forth across the beach in order to create a barrier against the incoming tsunami. However, Barry runs so fast he creates a time warp and travels backwards in time to before the Weather Wizard arrives. Thus, erasing anything that happened in the episode (aka Cisco lives and that's all that matters). Barry picks up where he left off from time-traveling, determined to fix the problems before they occur. Wells somehow figures out what happened to Barry (fellow time-traveler himself. Maybe there's a club with t-shirts) and tries to convince Barry to let events fall into place as before so as not to create more problems. But Barry doesn't listen. He captures the Weather Wizard before he can kidnap Joe. Thus, more problems occur. Snart (Captain Cold) and Rory (Heat Wave) return again to Central City to wreck havoc and ruin lives. 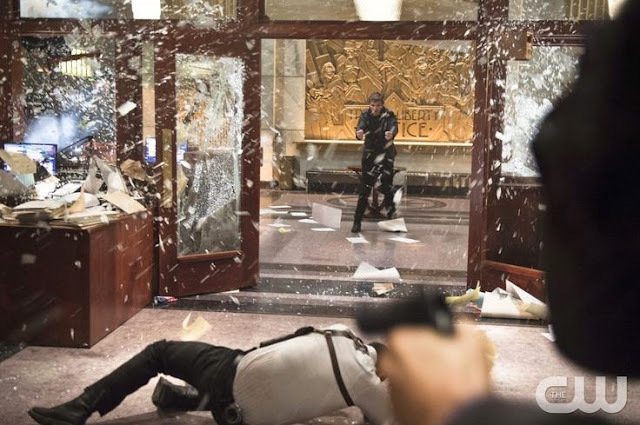 They send Snart's sister, Lisa, after Cisco and kidnap his brother to convince him to create new cold and heat guns as well as a new "gold" gun for Lisa. Meanwhile, Barry tries to extract Iris' true feelings for him from her but she shuts down and runs away. And Eddie hears about it and punches Barry. Barry realizes his changing the past/future resulted in Captain Cold and Heat Wave kidnapping Cisco and Iris rejecting him (again). 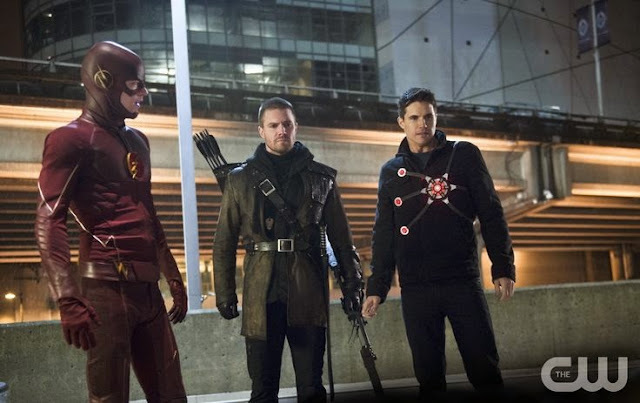 Snart also tortures Cisco's brother until Cisco reveals the identity of the Flash. (Uh-Oh) However, after a pretty cool showdown (where Barry wins of course), Snart promises not to reveal Barry's identity or to kill innocent people if they don't lock him in the particle accelerator. The Reverse Flash kills a reporter who is deep into investigating Wells and destroys evidence that links Wells to the death of Simon Stagg. A copy-cat Trickster comes to Central City and begins to set off bombs. In order to capture the copy-cat, Joe and Barry visit the real Trickster--from twenty years ago--who is in prison (No, but people how exciting is this??? We've got Mark freaking Hamill back as the Trickster in the same scene as Henry Allen--John Wesley Shipp--who played the Flash in the old TV show. So we've got Trickster and the Flash back together!!!). However, the entire copy-cat ploy is a distraction so the copy-cat can break the real Trickster out of jail. Trickster and his sidekick (who is revealed to be his son) extort wealthy patrons at a banquet by poisoning them and offering to give the antidote for a price. When Barry comes to save the day, Trickster places a bomb on Barry's suit that will explode if he stops moving at a specific speed. Dr. Wells teaches Barry to vibrate his molecules enough to go through solid objects, leaving the bomb behind. It works and Barry is able to give antidotes to everybody before capturing Trickster. Barry also becomes more and more suspicious that Dr. Wells is the Reverse Flash so he reveals to Eddie that he is the Flash in order for Eddie to protect Iris from Wells. The flashbacks reveal the Reverse Flash failing to kill child-Barry and the real face of Eobard Thawne. It's also revealed that Thawne cannot return to the future because he's drained his powers. Instead, he stalks the real Wells, learns the particle accelerator won't be finished for another twenty or so years, and kills Wells to take over his identity. Felicity and Ray arrive from Starling City in order for Ray to get help on improving his ATOM suit. Cisco and Ray become the best of buds, both overly excited with technology and naming villains (it must be Christmas). Meanwhile, a crazy robots scientist unleashes swarms of robotic bees to kill people she hates (or something, she's kind of crazzzy). Barry and Ray team-up to defeat the psycho-bee controller. Felicity helps by having a buzzing hacker's battle with the bee-lady. Felicity of course wins and they capture the scientist. Meanwhile, Eddie and Iris are fighting because Eddie can't tell her about the Flash's identity but she knows he's keeping something from her. 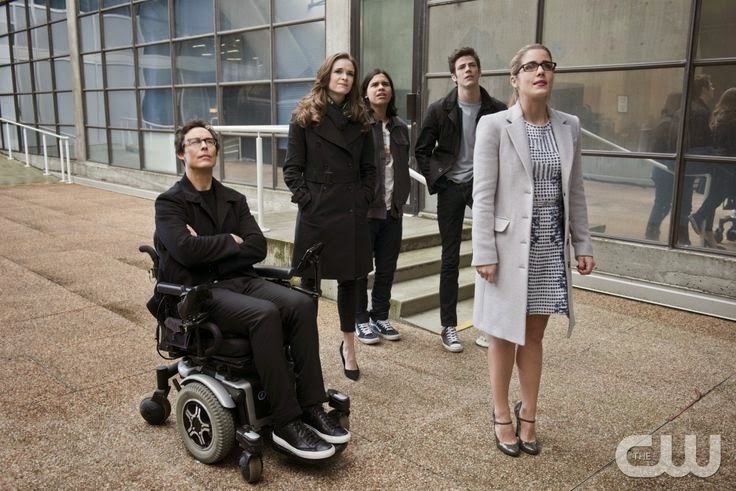 They have dinner with Ray, Felicity, and Barry (talk about the fifth wheel), which ends in a disaster. Barry also reveals to Cisco and Caitlin that he thinks Wells is the Reverse Flash. Cisco tells them he's been having weird dreams where Wells kills him via super-speed (the events of the original timeline). A meta-human named Hannibal Bates (I see what you did there, you writers you) who can shape-shift into anybody he touches. That's right folks, a n y b o d y. So he can shape-shift into Eddie, Iris, Barry, Caitlin, and yes, the Flash (and guess what? He does). Bates (I still can't get over his name), shifted as Eddie, frames our handsome detective for murder. Of course, Iris runs to Barry for help, begging him to clear Eddie's name. Of course, Barry agrees. However, Bates (seriously, his name is Hannibal Bates and he can shape-shift. Is nobody else laughing at this?) takes over Barry's form, shakes Caitlin up (aka he kisses her as Barry and she doesn't know what to do), and is stopped by Harrison Wells, who figures out it's not Barry. Caitlin creates a serum to stop Bates (I'm so sorry) from shape-shifting, Barry injects him with it, and they capture him. Thus, Eddie's name is cleared and everybody lives happily ever after. Except Bates. His true form is revealed to be a blank face because he cannot remember what he originally looks like (creeeepy). Meanwhile, Joe and Cisco go to Starling City to dig deeper into Wells' past (the death of his girlfriend in a car accident) with the help of Detective Lance. While there, Laurel (aka Black Canary) enlists Cisco to help her create a pretty cool scream shatter device (the canary cry) in exchange for a glossy photo of Cisco with the Black Canary (Cisco, I love you). During the investigation, they uncover a body buried near the crash site. The test results come in: it's Harrison Wells, the real Harrison Wells. 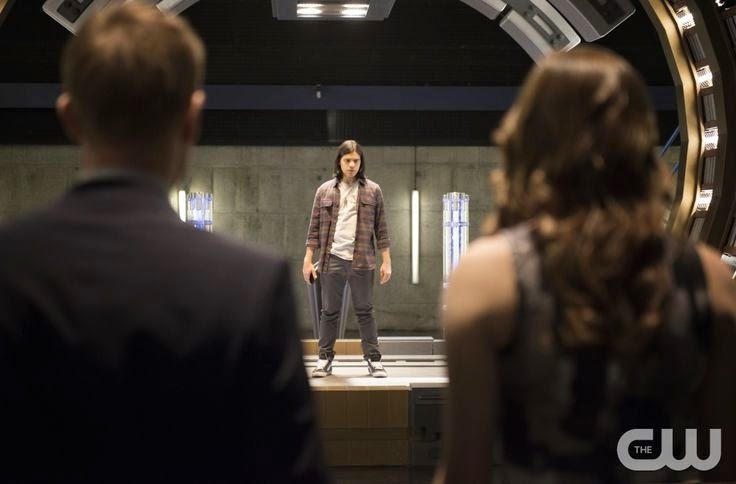 Barry, Cisco, and Caitlin discover the secret room that belongs to "Wells." Inside, they discover the Reverse Flash suit and a newspaper article from the future, which has a headline about the disappearance of the Flash written by one Iris West-Allen (*girlish screams*). 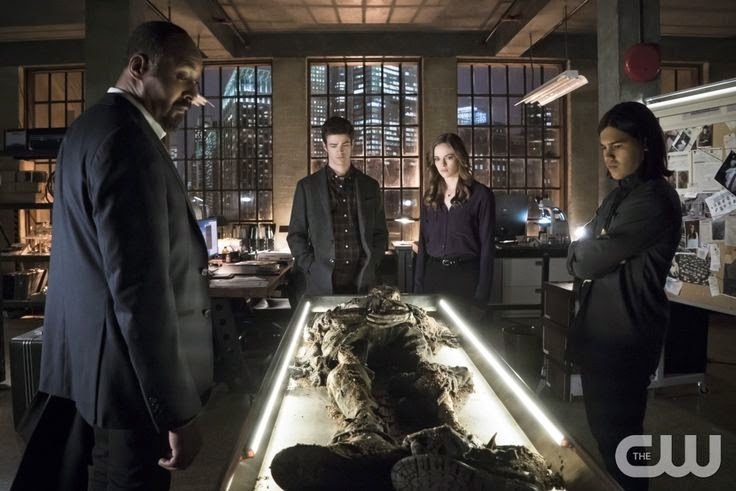 The revelation of the newspaper article informs Barry, Cisco, and Caitlin about future possible events; in addition, Cisco mentions that the Reverse Flash's arrival and meddling in the past might have created a "causal nexus," which is a time distortion paradox where forces from the future, caused by its past, goes to the past make itself possible in the future (whoooaa, talk about timey-wimey. Doctor Who What?). With this information, Barry convinces the team to trap Wells into confessing he killed Barry's mother in order to get his dad out of jail. Using what Cisco sees in his "dreams" (or alternate timeline memories) of confronting Wells, the team re-configures the containment field to protect Cisco. Caitlin plans to film the showdown to record Wells confession. However, the trap fails and Wells walks into the containment field toward Cisco. Joe and Barry arrive in time for Joe to shoot Wells before he gets to Cisco. Unfortunately, it isn't Wells: but Hannibal Bates shifted as Wells. The trap was actually Wells' own trap; he knew of their plan because he's a creeper who has had Big Brother watching them this entire time. Meanwhile, Eddie decides he wants to propose to Iris, despite Joe's disagreement. Just as Eddie is about to pop the question, Wells pops in and kidnaps right before Iris' eyes. Wells takes Eddie to some undisclosed spot and reveals to Eddie that he is actually Eobard Thawne, a future relative (still confused on that bit but hey, time-travel right). The Flash finds Iris and promises to find Eddie. As he leaves, Iris reaches toward him and gets shocked with a zap of lighting. This same thing happened when Iris touched Barry when he was in the coma. Thus, Iris knows Barry is the Flash. However, the thief from earlier appears again and this time, Barry learns it's General Eiling, who has been missing for a while. They learn Eiling had been under the control of the gorilla GRODD (who has been hiding out the in sewers). Thus, Joe, Barry, and Cisco go to the sewers to seek out this intelligent gorilla, but they are highly unprepared and chaos, terror, and tears ensue. Joe is kidnapped by the gorilla and put under high psychological attacks. Cisco and Caitlin create a device for Barry so his mind will be blocked from GRODD's attacks. 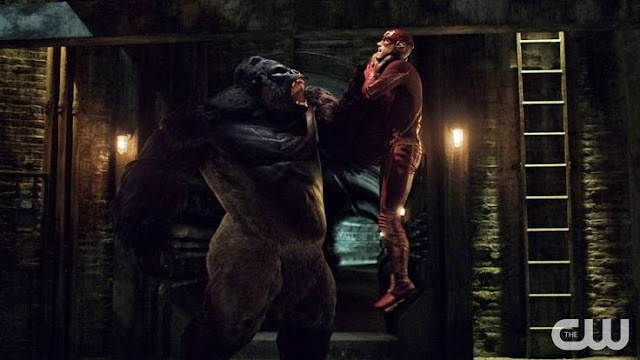 It works but GRODD knocks Barry through a wall and the device is damaged. Barry only defeats GRODD (for now) because Iris aids Caitlin and Cisco by helping Barry mentally concentrate on her above GRODD's attacks (kind of cheey and easy-peasy, but okay). Barry rescues Joe and everything is happily ever after (except we don't actually know what happened to GRODD. I doubt he's gone forever). Meanwhile, Wells/Thawne is up to no good (again) and he still holds Eddie hostage. He's been working on creating something that will get him back to the future (I'm just going to guess it won't be good and it'll end up doing something devastating to Central City. Just a guess though). 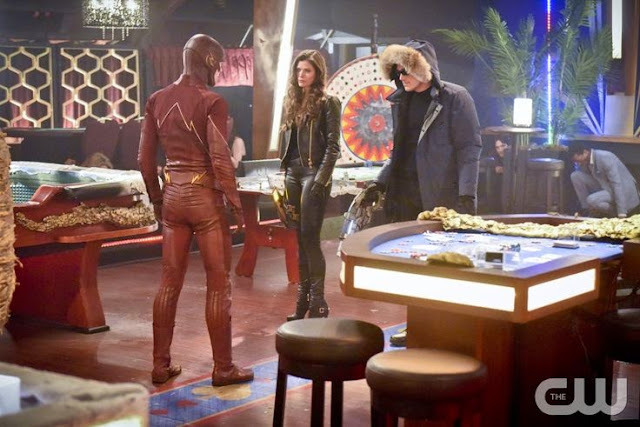 Thus, Barry goes to Snart (yes, that's right folks, the one, the only: Caaaptaaain Cooold) for help (and his sister, can't forget the Golden Glider). Somehow he strikes a deal with Captain Cold: in exchange for help transporting (aka freezing the meta-humans or something), Barry must get rid of all records of Snart (dental, medical, criminal). Despite Joe's protests, Barry goes through with it. And gets stabbed in the back (figuratively because Cold only has his freeze gun). Cold betrays them, sabotages the truck that carries the meta-humans (and somehow keeps them from using their powers??? how is the cold helping??? ), and brokers a deal with the metas: freedom in exchange for the hope that someday they'll owe Snart a favor (He's as tricksy as the Trickster, that one). Meanwhile, Eddie breaks things off with Iris--giving up because he knows the future and he believes Barry has always been nudging into the relationship. Iris sheds some tears, but other than that doesn't seem to react much to the news that she marries Barry sometime in the next ten years. We'll see. Wells returns to STAR Labs in time for the particle accelerator to be fully charged--but the team is ready and waiting along with a few friends. Ronnie/Firestorm arrives just in time to assist Barry in his showdown with Wells/Reverse Flash. And so does the one and only Oliver Queen (in his black hood, so how does this line up with the Arrow/Ra's story arc?). The three duke it out with Wells. They team up to defeat him, Oliver slinging some nasty nanobot arrows (courtesy of Mr. Tall, Dark, and Handsome Ray Palmer) that paralyze Wells' powers for a short time. Firestorm blasts him (or something) and Barry of course chases him. The epic Reverse Flash vs Flash showdown didn't feel as epic as I thought it would. I can hardly believe it's over. I'm sure Wells has something else up his sleeve (or suit or whatever). I thought it was cool to do another small crossover, but I expected more of the fight. Nothing in this episode indicates the events for the season finale, which is next week. What's going to be happen between the Eddie-Iris-Barry thing? Will the future happen as they've seen? Will Barry actually get to save his mother and get his dad out of jail? WHAT WILL SEASON TWO BE ABOUT? What are you thoughts The Flash's first season? Does this show have potential? What do you think will happen in the season finale?